"JPEC pays musicians and arranges workshops in high needs areas, to present interactive workshops which are available for students at any grade level or combination of grade levels from elementary to high school. These workshops examine the various components of jazz, the roles of various instruments, the importance of improvisation, composition and more. Since 2013, JPEC has provided musicians to more than 100 schools." Gil Dodick, who does programming for Reena Foundation reached out to me a few months ago, as Director of our Outreach program. He wanted to know if they qualified for a concert as part of JPEC's outreach program. The audience was a group of adults who have developmental disabilities, some quite severe, at Reena Foundation (www.reena.org). Reena serves adults of all nationalities, within the framework as described on their website. Aaron Lightstone, who is a music therapist, (www.musictherapytoronto.com) and Aviva Chernick, vocalist, presented that concert, paid for by JPEC. How fortunate we are to have someone with their backgrounds work with us. As the hour unfolded, it was heartwarming and truly amazing to watch the audience and how they responded to the songs of many cultures, by clapping, dancing or simply smiling, or rocking in their chairs. At one point, one individual took Aviva's hand, and with smiles on both their faces, would not let go. Another woman led the group, clapping to the rhythm of the song. Another two got up and danced; Another sang -- in disjointed words but thrilled to participate. We at JPEC know the value of music and how it affects the brain, by the studies we have published on our website. (Jazz Education). But seeing it in action is quite another thing. Thanks to the Reena Foundation for letting us have this special moment. 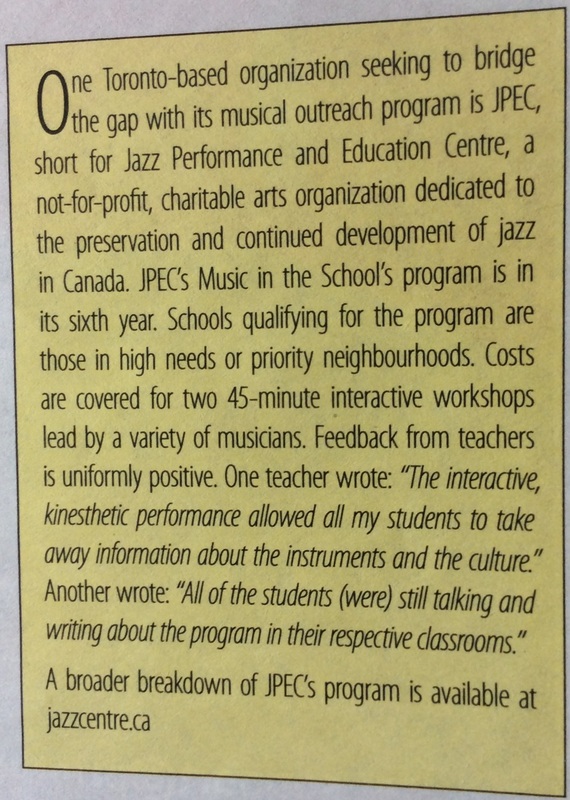 JPEC is highlighted in an article in Canadian Teacher Magazine on music as brain food for kids. Article was written by Wade Potts, a teacher for 35 years. * Fantastic, engaging, age appropriate, fun, education. * Students were very curious, interested and attentive to the beats.